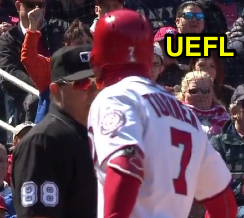 HP Umpire Doug Eddings ejected Nationals SS Trea Turner (strike three call; QOCN) in the bottom of the 6th inning of the Mets-Nationals game. With two out and the bases loaded, Turner took a 0-2 fastball from Mets pitcher Jacob deGrom for a called third strike; it was the only callable pitch of the at bat (the first two strikes were both of the swinging variety). Replays indicate the 0-2 pitch was located off the outer edge of home plate and belt-high (px 1.109, pz 2.934 [sz_top 3.467]), the call was incorrect. * At the time of the ejection, the Mets were leading, 4-2. The Mets ultimately won the contest, 8-2. This is Doug Eddings (88)'s first ejection of 2018. Doug Eddings now has -2 points in the UEFL Standings (0 Prev + 2 MLB - 4 Incorrect Call = -2). Crew Chief Joe West now has 1 point in Crew Division (1 Previous + 0 Incorrect Call = 1). *This pitch was located 2.34 horizontal inches from being deemed a correct call. This is the sixth ejection of the 2018 MLB regular season. This is the 3rd player ejection of 2018. Prior to ejection, Turner was 0-3 (3 SO) in the contest. This is Washington's 1st ejection of 2018, 2nd in the NL East (ATL 2; WAS 1; MIA, NYM, PHI 0). This is Trea Turner's first career MLB ejection. This is Doug Eddings' first ejection since July 31, 2017 (Doug Brocail; QOC = Y [Balk]).